WASHINGTON (CNS) — A little more than one day before an expansion was to take effect in a deferred deportation program known as DACA, a federal judge in Texas issued a preliminary injunction blocking the Obama administration’s effort. In a 123-page memorandum released by Texas Gov. Greg Abbott late in the evening Feb. 16, District Court Judge Andrew Hanen granted the request of Texas and 25 other states to temporarily block a planned expansion of Deferred Action for Childhood Arrivals to certain people who were ineligible for the original 2012 program. The expansion of DACA was to be rolled out Feb. 18, but Jeh Johnson, secretary of Homeland Security, said Feb 17 that the implementation would be delayed while the administration appeals. Meanwhile, organizations that have been helping people prepare to apply for the programs said they would continue that work, in anticipation of what they hope will be a reversal of the injunction. Rallies previously planned for the same week in dozens of cities to bring attention to the new programs were going on as scheduled. In some cases they picked up a new focus of protest against Hanen’s ruling. Johnson and legal experts who support the administrative actions said they were confident that Hanen’s order would be reversed on appeal and that the programs are on sound legal footing, within the government’s exercise of prosecutorial discretion. A second variation of DACA, Deferred Action for Parents of Americans and Lawful Permanent Residents, called DAPA, was to take effect in the spring but it also will be suspended until further notice, Johnson’s statement said. Hanen’s order did not address the legality of the program but focused on a government procedure and whether the administration needed to follow its requirements for how to promulgate a “rule change.” The judge’s order affects the two new programs nationwide. The existing DACA program is unaffected, Hanen said. 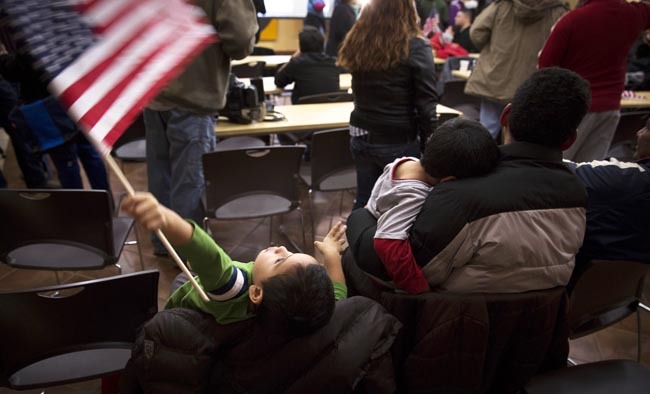 It allows certain people who were brought to the United States as children to apply for deferral of deportation. In return for registering with the government, undergoing a background check, showing they are in school or completed a high school education, and paying a fee, approved applicants receive a work permit, a Social Security number and the opportunity to obtain drivers’ licenses. Also unaffected by the judge’s order are other aspects of President Barack Obama’s November orders, related to the administration’s priorities for enforcement of immigration laws. Catholic legal assistance agencies around the country — many working through parishes and neighborhood organizations — have been gearing up to help immigrants apply for the programs since they were announced by Obama shortly after the November elections. “The unfortunate decision by the Texas … court has the effect of confusing, frightening, and discouraging eligible immigrants from applying,” said Jeanne M. Atkinson, executive director of CLINIC, the Catholic Legal Immigration Network. CLINIC has been training people to advise potential applicants and help them prepare applications. “We know these people as our neighbors, as our friends and as our brothers and sisters in Christ,” she said. In a Feb. 17 teleconference, several attorneys who wrote an “amicus” or friend-of-the-court brief opposing the states’ effort to block the programs said they remain confident that the administration’s orders will withstand the legal challenge. Steven Choi, executive director of the New York Immigration Coalition, said the lawsuit is politically motivated, but only a temporary setback.